What do students really think about the Chimes? To get some constructive criticism, we interviewed students around campus, hoping to get as much input as possible. When asked their least favorite thing about the Chimes, students struggled to think of answers. And that wasn’t because they couldn’t think of anything bad to say. They actually didn’t really have an opinion on the Chimes at all. “I’ve honestly never read the Chimes before,” first-year nursing major Sarah Markel said. That kind of response was to be expected. Not everyone reads newspapers. And the trend of unknowing continued. “I guess, maybe, that I don’t know that much information about the Chimes,” first-year Sydney Preston said. Even when a student that actually reads the Chimes was finally interviewed, her input was similar to the others. So what could we possibly do to fix the problem that so many students seem to have? We turned to some of the other Chimes staff for their thoughts. Barr isn’t the only staff member who doesn’t read what is published. If the students that work for the Chimes don’t even read it, what hope is there? “I would read the whole paper if everyone else was as good as a writer as I am, but that’s not the case,” Sydney Deibert, staff reporter, said. Upon hearing about the staff’s response to the question, editor-in-chief Valerie Szabo called an emergency meeting. We were informed that not reading the newspaper we work for is something that happens, but not something we’re supposed to talk about. “From now on, pretend that you’ve read the entire thing,” Szabo said. 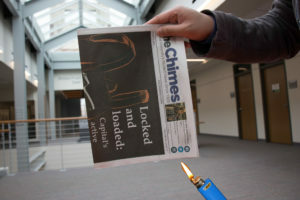 We’re delighted to announce that the Chimes staff now reads every sentence within every issue. And if we can read every article, other students should be able to read at least one occasionally.